Are you planning to spice up your car’s entertainment by purchasing a car DVD player? That’s a great movie because you can watch movies and catch up with your favorite T.V series when stuck in traffic or going on a long drive to visit relatives during holidays. Today, you’ll learn the Things to Consider When Buying a Car DVD Player. With hundreds of car DVD player brands available at your local automotive shops and online stores, you need to know what to look for when buying a Car DVD Player. Why? Because this information will enable you get value for money. 2. Share these helpful tips for buying a car DVD player with your friends! When you walk into an automotive shop, you’ll notice four different types of car DVD players. A Headrest player comes with screens that fit behind the driver and co-driver seats. This type is suitable for small sedans because the screens are no bigger than 7 inches. Alternatively, you can buy an In-Dash DVD player because you only need space in your dashboard. If you own an SUV or roomy pickup truck, consider getting a flip-down car DVD player. Why? Because they feature larger screens to ensure passengers in the back seat enjoy optimum viewing. Alternatively, you can buy a 10-inch portable car DVD player and mount it on your dashboard when driving with one passenger. The size of your car determines what screens to buy for your car DVD player. Seven-inch screens are ideal for subcompact cars because they easily fit inside dashboards and headrests. Avoid installing a flip down DVD player because it will obstruct your rearview when reversing or parking your car. If you’re looking for a car DVD player that has a GPS system, purchase a system with a 9 or 10-inch screen. You need a large screen to view maps because small screens sometimes make it too hard to distinguish major roads from minor ones. After buying a good DVD player, you need a car stereo that matches it in terms of high-quality sound. That’s why car experts recommend purchasing a DVD player from the same electronics manufacturer as your car stereo system. Doing this means that you won’t have to buy additional accessories to transmit audio and video between your DVD player and car stereo. Make sure you get a DVD player that plays videos stored in your digital car stereo system. An Android car stereo plays videos in various digital formats such as AVI, FLV, MP4, and MKV. 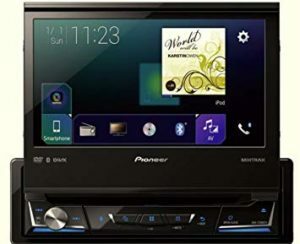 This versatility allows you to connect your DVD player and watch movies stored in your Android car stereo’s memory. Do you prefer listening to your own playlists while driving? That means you should buy a car DVD player that has a 3.5mm jack pin to enable you to plug in your iPad, iPod, or smartphone. It should also have a USB port where you can plug in your phone and access your recorded videos. A good car DVD player should also have slots for your flash drives and memory card. This is necessary for professional photographers because the large DVD screen gives you a clearer view of your shots compared to your 4-inch camera LCD screen. During a long road trip, boredom creeps in after watching all the movies you had carried. Boredom makes kids restless and you’ll find yourself constantly shouting to keep them still. However, continuous shouting will only give you a sore throat and headaches. Nowadays, you’ll find several car DVD players that have inbuilt satellite TV. Your kids can catch up on their favorite weekly cartoons and you enjoy peace of mind on the road. It also comes in handy during Super Bowls and highly anticipated NBA games. This TV will also help you stay updated on breaking news. Are you a video game enthusiast? Perhaps the main reason why you need a car DVD player is to enjoy long gaming sessions when camping. Well, you obviously need a large screen, preferably a flip down model that’s at least 10 inches. A smaller screen will force you to squint your eyes trying to locate the soccer ball when playing FIFA. Do some research on car DVD players that don’t require you to purchase special cables to support your PlayStation or Xbox console. The DVD player should allow you to play music from your flash drive or smartphone while playing video games. Just like car stereos, vehicle DVD players make your car more appealing to thieves. If you only have a third party auto insurance plan, it’s your responsibility to protect your car DVD player. One way of doing this is by purchasing a player with a dummy faceplate that resembles an analog car stereo. By placing it in front of your in-dash DVD screen, you’ll deceive any thief that’s eyeing your car. There are special headrest covers that conceal mounted screens available in your local automotive shop. Feel free to buy a good car alarm system to frighten burglars. It’s no secret that highly rated car DVD players are expensive. Why? Because they have outstanding features and come with warranties that can go up to 24 months. You’re also confident that all internal components come in mint condition. If you’re not planning to spend big bucks but still want a high-quality player, consider buying a used car DVD system. Make sure you tag along someone who knows how to inspect car DVD players. Avoid buying used car DVD systems online because there are high possibilities of getting ripped off or receiving a junk equipment. These tips will help you get value for money because they guide you on what to look for in a good car DVD system. Buying a DVD player that’s compatible with your phone and video games ensures that you don’t waste money on unnecessary accessories.